Alfred R Ramirez obituary. Carnes Funeral Home. 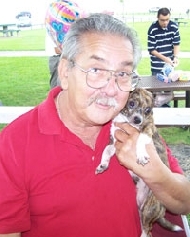 Mr. Alfred R. Ramirez, Jr. passed away on August 19, 2012. He was born in Houston, Texas on December 20, 1943. The family will receive guests Thursday, August 23, 2012 at 5:30 p.m. with a 7:00 p.m. Reciting of the Rosary. Funeral Services will be 10:00 am Friday, August 24, 2012. Both services will be held at Carnes Funeral Home - Texas City 3100 Gulf Freeway, Texas City, TX 77591.